I stopped working in the fall of last year, and it’s been one of the best things I’ve ever done for my business, my practice, and for the day to day experience of my life. I deeply see how my Triad of Change was in action, and want to share the unfolding with you. The miracle happened in an instant, as miracles often do. The idea of taking the rest of the year off immediately translated into a feeling inside my body. I felt free, open, expansive, creative. The magical moment was in my allowing that feeling to just be.. and be.. and be a little longer. I stayed present with that feeling, breathing and staying with the potentiality that I could have this in my life. The feeling fed my internal process long enough for me to shift the question that I was about to ask myself: Can I stop working for the next six weeks? Can I create the opening in me that makes life feel open like this? 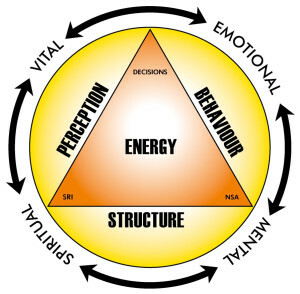 My Triad of Change works best for me when I ignite my own Perception, and link it with Structure. That’s my miracle starter, each time and every time. If I had let myself ask a question about Behavior, like “What would I have to do to be able to take the next six weeks off?”, if I had played out scenarios in my mind of what would have to happen to make it work for all the people in my life, I would have dropped the idea like a hot potato! It’s too painful to think about all the many things I would need to arrange, all the many things I would be NOT doing during my time off, and worst of all, how other people would respond to my choices. Instead I looked at my calendar and continued to conjure up the feeling of possibility, which sure enough built and built on itself. I began to see how this could really work for me, and I just started living it. I continued to go to the office and run my errands and meet the daily demands of my life, but it was all in the context of being on vacation. Giving myself a time frame had helped to satisfy any doubts I may have harbored about long-term consequences, so I simply went about my business feeling secure and confident that I was taking a break and it was okay. And that’s when all the blessings began to pour in. Once I started telling people that I was taking the rest of the year off, I began to meet with dear friends for lunch and tea, I fell into impromptu chats at the grocery store, and it all felt great! From out of the blue, I was having new ideas for my practice, for my home, for my family. I didn’t turn those ideas into to-do lists because I was on vacation, and (say it with me) it felt great! I was enjoying the pleasure of creativity and prolific inspiration, and it was quite fun. I started writing, I started playing, and I started wondering whether I ever really needed to go back to work. Taking the rest of the year off freed me for the rest of my life. I know now that I can create whatever I want, and I know how to use my Triad of Change to get me there. The new year has begun, and I’m no longer on vacation and I’m also not back to work. It’s a new frontier for me. What would it be like for you to find not only your freedom, but also the recipe for getting what you want, every time?